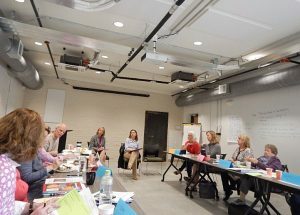 American Farmland Trust (AFT) held its final session of a three-part Women and Land Conservation Learning Circle series in Easton, Maryland, on March 30. AFT holds women’s learning circles across the country to help female landowners become more knowledgeable and confident about farm conservation issues, practices, and available resources. According to AFT, more than 50 percent of the women attending these sessions take a conservation action within six months. The recent learning circle workshop, “Future of Your Farm: Planning a Legacy,” focused on two important agricultural law topics: leasing and succession planning. Talbot County farmer John Swaine and University of Maryland Extension Educator Shannon Dill spoke about their leasing experiences. Swaine farms over a thousand rented acres of farmland. Through humorous stories and anecdotes, Swaine expressed the need for communication between landowners and tenant farmers, discussed the many conservation practices he has installed on his Royal Oak, Maryland, farm, and emphasized the value he places on land stewardship. Dill told the attendees about the many resources available to landowners and farmers to help draft a farm lease, including the University of Maryland Grain Marketing webpage which lists suggested rental rates and Agricultural Leasing in Maryland. ALEI Legal Specialist and Senior Research Associate Sarah Everhart discussed the value to both the landowner and the tenant farmer of a written lease. Everhart said oral leases leave both parties to a lease vulnerable to misunderstandings which can lead to costly legal action and, importantly, hamper implementing conservation practices on rented farmland. Everhart explained that a well-formed farm lease encourages a tenant farmer to make farming decisions which both increase yields and maintain the long-term viability of the land. Everhart also referred to the ALEI companion document to the Agricultural Leasing guide now underway which will help landowners and tenants create leases to address conservation practices and soil health. Workshop attendees also heard from local estates and trusts expert, C. Lee Gordon, Esq. Gordon had an interactive discussion with attendees about the importance of succession planning and how legal tools such as trusts, business entities (LLCs, Partnerships, etc. ), and a well-formed will can help landowners preserve their legacy. Representatives from the Eastern Shore Land Conservancy, the Maryland Agricultural Land Preservation Foundation and the Natural Resources Conservation Service, discussed how attendees can implement practices to be better stewards of their land today, as well as use easements to ensure their land remains undeveloped in the future. In the coming year, American Farmland Trust will hold Women’s Learning Circles sessions throughout Maryland; keep an eye on the upcoming events section of the ALEI website. The University of Maryland – College Park, Department of Agricultural & Resource Economics and the Agriculture Law Education Initiative (ALEI) was recently awarded a $14,197 Northeast SARE (Sustainable Agriculture Research and Education) Partnership Grant to create and administer on-farm food safety educational programs during winter 2017-18. SARE grants are given to individuals or organizations to fund research and education projects, according to the grant website. With the grant, ALEI plans to collaborate with University of Maryland Extension educators, the Maryland Department of Agriculture, the Maryland Department of Health and Mental Hygiene, and farmers to create training sessions for farmers dealing with ways to avoid contaminating farm produce. The idea to develop the on-farm food safety training program began with ALEI legal specialists Sarah Everhart and Ashley Ellixson. “Last year, when presenting to farmers at Maryland Good Agricultural Practices (GAP) trainings, we had a lot of questions from farmers on how GAP and the new Food Safety Modernization Act (FSMA) standards applied to individual operations,” said Everhart. GAP trainings aim to teach farmers about decreasing the likelihood of contaminating produce, addressing water quality, fertilizer use, and animal activity, according to Maryland Department of Agriculture. FSMA, signed into law in 2011 by the federal government, aims to guarantee the food supply is safe by focusing on preventing food contamination rather than responding to it, according to the U.S. Food and Drug Administration. Trainings will be offered at three different types of farms – community-supported agriculture, agritourism, and on-farm market — in different locations across Maryland. “The goal is to equip farmers with the knowledge they need to prevent foodborne illnesses, reduce health risks and thereby improve the quality of life of Maryland’s agricultural community,” said Everhart. Members of different regulatory agencies will present on particular topics as part of Everhart’s planned curriculum at the trainings. Watch the ALEI website for more details. Audience members asked questions on monitoring point and nonpoint source water pollution, air quality, and stipulations in the Maryland right-to-farm bill. Goeringer noted that the Symposium brought together a diverse audience, with members from industry, NGOs, educators, and those interested in the industry in general. The full panel session is available here. Find ALEI’s publication on the Maryland right-to-farm law here. ALEI Legal Specialist Paul Goeringer and Research Associate Mayhah Suri attended and presented at the Extension Risk Management Educators Conference in Cincinnati, Ohio on April 27 and 28, 2017. “[The] focus is on risk management issues faced in agriculture and innovative ways extension around the U.S. teaches farmers learn how to manage those risks,” said Suri. The conference was hosted in the Hyatt Regency in downtown Cincinnati. Topics covered at the conference discussed managing the risks of agribusiness, including production, marketing, financial, legal and human risk, according to Extension Risk Management Education. At the event, Goeringer presented “Programming in the Sun: Extension Programming for Alternative Energy Leases.” He focused on how within the past few years, the opportunity for landowners to use alternative energy in Maryland has grown, and he explained the complexity of the leases associated with solar energy. Suri delivered a talk about “Managing Risk: New Markets and New Farmers” at the conference. She spoke about the main components of two extension programs, including ALEI’s extension work. The event was an opportunity to connect and learn with other extension educators from around the country and make other university educators aware of ALEI resources. Approximately 150 people attended the event. Next year, Suri hopes to attend the event again. Goeringer also plans to take connections made during his session to develop partnerships and resources to help landowners in Maryland understand risk management issues.